Strollers are becoming increasingly popular for small and medium-size dog breeds. Our VIVO Four Wheel Pet Stroller takes a look at one such product which is currently gaining excellent ratings from customers. This carrier is suitable for a variety of different pets including cats and small animals like guinea pigs and rabbits. Of course, strollers aren’t to everyone’s taste. If you’re looking for a safe way to transport your animal, however, this product is well worth a closer look. 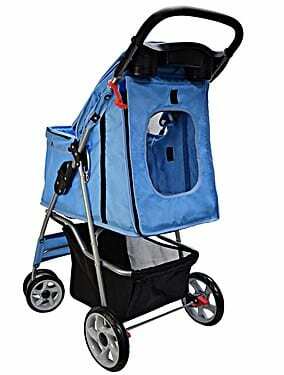 Strollers are great if you want some extra storage space with your pet carrier. If you have a dog that has mobility problems, they certainly tick all the boxes. Many buyers like to jog when they take their pet out, and the VIVO pet stroller is ideal for this purpose. 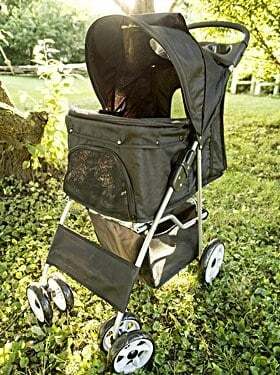 While strollers can have their limitations, they often provide superior safety and have more space for your pet. Our review of the VIVO Pet Stroller looks at the pros and cons, what customers are saying, and how to get the best out of your stroller. CLICK HERE to Read Customer Reviews & Check the Latest Pricing on Amazon! 1.2 What Sizes and Colors Are Available? 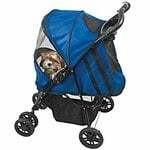 Pet strollers are ideal if you want to combine taking your dog out with getting a little more exercise, such as jogging. The trouble is that many strollers are not quite up to the job. The larger wheels and better suspension of the VIVO Four Wheel Stroller, however, make it perfect for a jog around the park or a hike. It’s also a great product to choose if either you or your pet have problems with mobility due to arthritis or joint problems. You don’t have to carry anything around, and the stroller is light and easy to push. With ample storage space, it’s got ample room for the shopping or all those pet toys and treats. You don’t have to worry that the stroller is going to roll off down the park, either. There are two locks on the back wheels for added security. There’s plenty of mesh to give great ventilation for your dog or cat and tethers for attaching a harness for extra safety. If you live in an urban area where you don’t want your dog to be underfoot in a crowd, the VIVO Pet Stroller is the ideal product to have at home. It’s easy to collapse and put up in just a few seconds, and there’s enough space in the basket to make even medium-sized dogs, such as pit bull terriers, comfortable. VIVO is a small company that started over 15 years ago in a basement and are focused on producing ergonomic products that make our lives easier. Their Four Wheel Pet Stroller is an example of how they look at what customers want and then design something really useful. 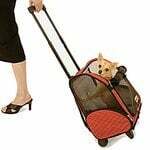 They market their stroller as ‘first class travel for your pet’. This is a stroller that only comes in one size but is designed to take pets up to about 30 lbs. That means it’s suitable for small to medium size dogs. The basket measures 19 x 12 x 19 inches which provide plenty of room, and there’s more than enough head height for most breeds. It’s slightly heavier than similar strollers at just over 13 pounds. The stroller comes in a range of different colors including black, blue, green, orange, pink with white polka dots, and purple. CLICK HERE to Read Customer Reviews & Find Out the Price on Amazon! Choosing a good stroller is important, and there are many things you need to consider before you spend any bucks. If you are looking to use your stroller while jogging, the first feature you should investigate is the wheels. On some products, these are too small and don’t have enough ability to absorb shock. It has large, well-supported wheels. Other strollers also only have three wheels which can make them less stable. The VIVO has four and is ideal for that gentle jog around the park. Space is another consideration, and the good news is that this product has more than enough for most small to medium size breeds. There’s a padded foam base on the basket for extra comfort and enough ventilation even for larger dogs. 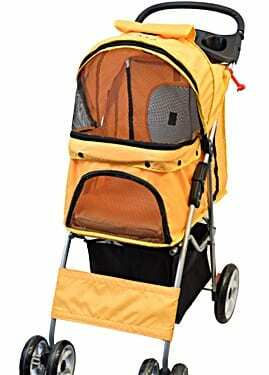 This is a substantial and sturdy pet stroller that can cope with breeds up to 30 lbs. The large basket/cabin has three access points to put your pet in. There’s a padded foam base for additional comfort but also plenty of room for your pooch’s favorite blanket. You can collapse the top of the canopy to open it up for your pet. You get a cup holder as well as a largish basket beneath the cabin to store things like pet treats and toys. There’s a safety lock on the back wheels so you can secure the stroller while you take a rest. The cabin has a safety clip you can attach your dog or cat’s harness to. Because it has four wheels, you get a firmer ride and less chance of a spill. It’s easy to collapse and store away with two release catches on either side of the armrests. Some customers have complained that the cup holder isn’t suitable for water bottles, something the makers might like to take a look at. There is some assembly required which was a problem for a few customers. Zippers can get stuck on occasion. Overall, the VIVO Stroller is a strong addition to this product area. 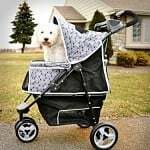 Compared to a lot of other strollers on the market it can cope with a greater variety of terrain and is certainly designed for those who like to jog with their pet. The fact that it can comfortably take larger size breeds is a bonus, and there is plenty of storage underneath to boot. This is the kind of pet carrier product that will suit a wide range of different customers. It’s designed for those energetic customers who like to jog while out with their pet, although it’s just as good for those with mobility issues. Perhaps your dog or pet is recovering from an operation or is getting a little too old for long walks. Maybe you have miniature breeds that need to be carried on occasion. Maybe you don’t want to be carrying a pouch or bag around and prefer to push a stroller. The VIVO pet stroller provides a secure and smooth ride for your pet and easily stores away in a cupboard when not in use. It’s also a suitable carrier if you live in a busy city or town and want to keep your pet secure while out on the street. This is the kind of stroller that has proved popular with a lot of different customers across the US. It’s amazing the range of pets that it’s used for. We take a closer look at what people have been saying about the VIVO Pet Stroller. You might be surprised that it’s not just dogs and cats that are taking a ride in this stroller. One buyer bought it for their duck and found it invaluable. It’s also suitable for smaller pets like guinea pigs and rabbits. Larger dogs fit comfortably in the roomy basket. Customers have pointed to the benefits of having a canopy that you can push down. This works particularly with older, less mobile dogs that aren’t like to try and jump out. If you need something more secure, however, the canopy can be easily raised up and fixed in place. This seems to be a favorite product for customers who have dogs with health issues. One found that it was ideal for their arthritic chihuahua. It’s also proved popular for dogs or other pets that are recovering from surgery or illness. As with many strollers, there can be an issue if you have a dog or cat that likes to scratch or bite. Some owners with cats have certainly discovered that their anxious pets can damage the mesh if they are not properly acclimatized. This is an issue which is common with most strollers and carriers, however. Those that have discovered a problem with stroller have contacted the VIVO helpline and found them receptive and responsive. Parts are quickly replaced and plenty of advice given to customers to get the best out of their stroller. This is a strong stroller that delivers on many levels. If you are considering a stroller rather than a traditional carrier, it pays to get a good quality one in the first place. The four-wheel design makes this a sturdy product that is suitable for anyone who likes to jog with their pet. It has ample storage space, and the basket for the pet is both roomy and comfortable. For those wanting to buy a quality product that is built to last, the VIVO Four Wheel Pet Stroller is well worth a second look. CLICK HERE to Buy the VIVO Four Wheel Pet Stroller on Amazon!